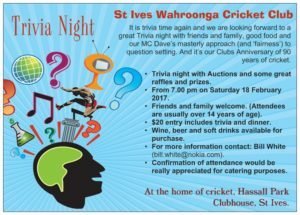 It is trivia time again and we are looking forward to a great Trivia night with friends and family, good food and our MC Dave’s masterly approach (and ‘fairness’) to question setting. And it’s our Clubs Anniversary of 90 years of cricket. 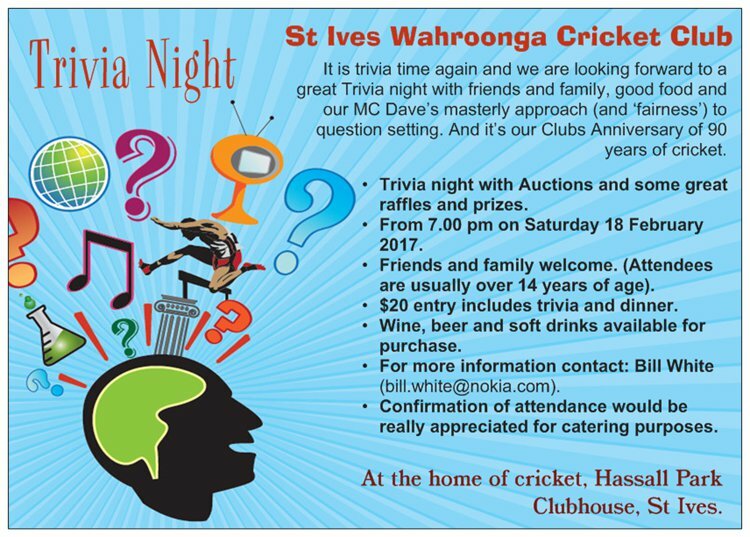 · Trivia night with Auctions and some great raffles and prizes. · At the home of cricket, Hassall Park Clubhouse, St Ives. · From 7.00 pm on Saturday 18 February 2017. · Friends and family welcome. (Attendees are usually over 14 years of age). 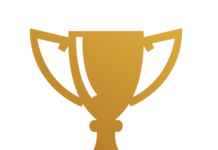 · $20 entry includes trivia and dinner. · Wine, beer and soft drinks available for purchase. · For more information contact: Bill White (bill.white@nokia.com) Confirmation of attendance would be really appreciated for catering purposes.